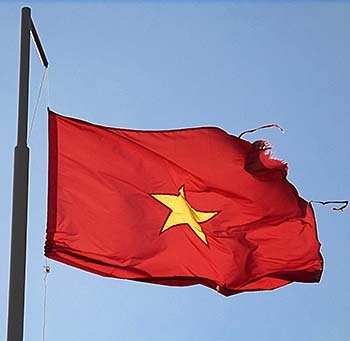 Vietnam (officially the Socialist Republic of Vietnam) is one of the last countries who still stick to a kind of real-existing communism. At least at the surface. What was barrack socialism in the past, has been changed into a widely free market society by maintaining a one-party system. Political dissens is sharply oppressed. However, western powers don't blame the regime much for human rights abuses. Vietnam is nowadays an ally of the USA in an alliance against China, and allies don't get too much blame. Besides, there are worse cases in the world than Vietnam, although the oppression of free speech, particularly among bloggers, is serious. As a country which is smaller than Germany, a population of 90 to 96 million people is much. The big urban centers are heavily overpopulated. The big cities, above all Saigon (Ho Chi Minh City), is just the largest example. The population of Vietnam is, unlike that of the two neighbouring countries Laos and Cambodia, very heterogenious. Most apparent for many visitors is the difference between the south and the north, but there is much more. A big variety of different ethnics, religions and cultures exist in Vietnam. The majority of the population concentrates in the wide plains in the south, namely the Mekong Delta. But all the stretch along the easter seashores, with it's fertile plains, are heavily populated. They open in the north at the mouth of the Red River and stretch far to the west around Hanoi. The western part of the country is dominated by the Annamite Mountain Range. These mountains are partially quite high and are the border regions to the neighbouring countries China, Laos and Cambodia. A great variety of hill people live here. Vietnamese history is reaching back far into the past; the first kingdom of the Viet in north Vietnam emerged already in the middle of the first millenium BCE. The time between 1860 and the Second World War was coined by French colonialism. In the second half of the 20th century the country became a hotspot in global politics for the long-lasting wars first against the French colonial ambitions and then against the US aggression in the American Vietnam War, what was the third biggest war in the last century. Vietnam was then also the state which beat down the Khmer Rouge regime in Cambodia. Vietnam covers the complete easter side of the Indochinese Peninsula. It borders to the Gulf of Tonkin, the Gulf of Thailand and neighbours to China, Laos and Cambodia. The size of the country is with 333.000km2 almost that of Germany (357,000km2). The long coastline to the eastern and southern shores of the South China Sea stretch over 3,400km length. Many Vietnamese islands dot the sea. Vietnam also claims rights on the further offshore lying Spratly and Paracel Islands, who are under dispute of several surrounding countries; large offshore oil reserves promise future riches and cause trouble in the present already. The country is over 1,650km roughly aligned into a north-south direction, while the middle part is at it's narrowest spot only 50km wide. 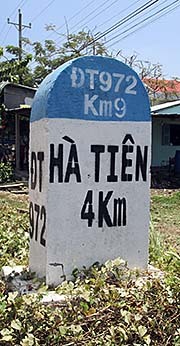 Vietnam's geography can be departed into five different main regions. The south is widely coined by the Mekong Delta, what is a huge alluvial plain with a great number of rivers and canals, of who many are 1,000 to 2,000 years old. Here is the population density very high and many cities lie in the delta. The biggest of them is Saigon (Ho Chi Minh City), which is now one of the largest boomtowns in Southeast Asia (and world wide). 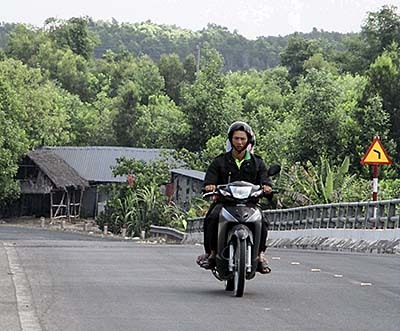 North of the Mekong Delta, apart from the coast, stretches the Annamite Mountains in north-south direction. 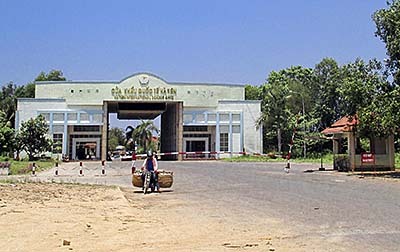 They form the border to the neighbouring states Cambodia and Laos. The Annamite Mountains are less dense populated than the coastal areas. A large part of the population here are numerous different hill tribes. The northern part of the country is coined by the Red River Delta, a huge plain around the capital Hanoi. These plains are, as well as those around the Mekong Delta, used as acreage for large scale rice production. At the coastline of the Gulf of Tonkin lies the famous Halong Bay east of Hanoi. The southern and northern plains are connected by a long coaststripe, also plains who are densly populated. In this middle part of Vietnam, north of Danang, is a climate border, which separates the hot, humid, tropical climate of the south to a cooler, subtropical climate in the north. The northernmost part of Vietnam are the Yunnan Highlands, who are also part of China. Here are Vietnam's mountains higher than further south. The Fan Si Pan (3,144m), is the highest peak in the country, close to the Chinese border. Here, as in the Annamite Mountains, live many different hill tribes. Topographic Map of Vietnam. For an enlarged, interactive version of the map click the link. The leading triumvirate of the state consists of the three highest party functionaries of the communist party of Vietnam. The general secretary of the party, Nguyen Phu Trong, is the highest decision maker, followed by the primeminister and the state president. On April 7th, 2016, Nguyen Xuan Phuc became the new elected primeminister of Vietnam. Getting 446 out of 490 votes in the national assembly, the election result was no surprise; these elections are arranged beforehand in Vietnam. There was no other, alternative candidate. Phu, 61 years old, was picked at the congress of the communist party in January. Vietnam was the only Southeast Asian country with a higher economic growth in 2015 than in the year before. Nevertheless, there are big problems for the new head of government. The state is in a dept crisis by a serious budged deficit. The Mekong Delta, one of the main rice and other crops producing part of the country, is suffering salt intrusion due to a long-lasting drought (El Nino effect) and lower water levels in the Mekong River due to dam constructions in China and at many tributaries of the grand river. Besides, there are serious tensions between Vietnam and China, which claims disputed islands in the South China Sea (the Spratly and Paracel Islands), and started partially to fortify isles. Further there are plans to reform the state-owned sector (privatization) and the banking system. Also corruption is a problem which the primeminister said in it's inauguration speech he will fight against. One has to keep in mind that Vietnam is one of the countries who are going to join the TPP (Trans Pacific Partnership Agreement). The newly elected president is, since April 2nd 2016, Tran Dai Quang, an old secret service man. There was no other canditate for the election. Before, Tran Dai Quang was minister of public security and chief of the police. The 59 years old high functionary is seen as a conservative hardliner. He criticized last year in November oppositional groups who were organized in over sixty (illegal) groups. Criticizing the legality of the one-party system is a criminal offence in Vietnam. The president is also commander-in-chief of the armed forces. However, after the constitution, the national assembly is the highest power institution. It's getting elected every five years. The communist party is in control of the election process. 90% of the parliamentarians are party members, and the remaining 10% are chosen by the party; there is no opposition in the parliament. Vietnam has since 1946 it's fourth constitution in force. Freedom of speech, freedom of assembly, press freedom and freedom of religion are formally granted. Article 4 of the Vietnamese constitution from 1992 claims the leading role of the communist party and bans all oppositional parties. Vietnam has no independend judiciary. All the judges, lawyers and other staff in the court system are appointed by the communist party or the high peoples court. Vietnam maintains the death penalty against offenders of corruption and drugs. There is a hefty passport obsession in Vietnam among the state bureaucracy. Staying in a guesthouse, the host must register the guest with his passport at the police. If one stays longer than expected, they must go again to prolongue the stay. They need the passport again, because apparently the memory of the state bureaucracy does not last longer than one, two days. One should expect them to have a copy of the passport, but one can not expect too much in such a case. Renting a motorbike means to leave the passport at the motorbike's owner. It's then not available for the police, what is too bad. If you go around in the country you may have some encounters with official posts or administrations. There are many of them around. The officials are always dressed neatly in military uniforms. Among the first things they ask is for one's passport. Generally, my impression is that there is almost any official building guarded by uniformed, armed soldiers, who are practically all men. That includes also (at lesat some) bus stations. The passport and controll possession in Vietnam is not even the worst possible. I remember the old communist states in east Europe, where one had to produce a full itinerary for the police weeks in advance, with a complete and accurate record of the planned destinations and hotels where one would stay. Every time directly after arrival in a new place there one had first to go to the police office to announce one's arrival. After the American Vietnam War, the country got united under the communist system of the north. The free market economy of the south, which was completely depending on American money transfers, got restructured in a Sowjet pattern. The companies were nationalized, the agricultural sector collectivized. The USA put an economic embargo over Vietnam; America and other western countries weren't allowed to trade with Vietnam. The World Bank and the International Monetary Fond didn't give credits to the country. Vietnam suffered heavily under the aftermath of the American Vietnam War; the north was widely destroyed by the decade long American terror bombardements. Together with the environmental damage (e.g. agent orange) this meant a terrible poverty for the people of Vietnam. The struggling economy didn't stabilize, and in the 1980s it came to starvation and hyperinflation. Vietnam's survival depended on the support of the the eastern block, who transfered estimated three billion dollars annually. In 1986 the regime changed it's course from a centrally planned economy to a free-market oriented economy. They followed a similar pattern as the Chinese regime did from 1978 on. Foreign investment became granted. That was good enough for the last remaining superpower, the global protector of turbo capitalism, to lift the embargo on Vietnam in 1993. In the years after that, the economic growth of Vietnam was, due to international investment, often around 10% annually. In 2007, Vietnam joined the WTO. It is considered by the World Bank as a newly industrialized country since 2011. The state-owned companies make still a large part of the economy. But, as so often, they can not compete on the free market (particularly the world market) with private companies. They are often in debt and a risk for the banking system. Well, one can say, as we know, it's the same thing with private corporations. The neoliberal doctrine of a radical free market economy, however, can not accept nationalized companies. 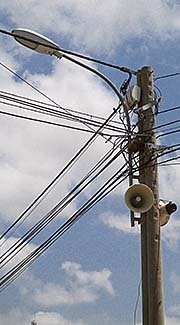 They have to be privatized, means, sold out for practically nothing to private investors and then either shut down or, when being extremely profitable like the telecommunication sector, promoting ruthless tycoons who do no good with the fortunes they press out of the consumers, who they cheat so bitterly. It is still so, that the southern economy is better off than the northern. The reasons for that are not fully clear. The north was heavier destroyed in the American Vietnam War than the south. The south also has more experience with the capitalist free market economy than the north has. Interestingly, Vietnam is a raw oil exporting country; about 10% of it's export volume is made by oil. In the industrial sector products like textiles and shoes dominate. In the agricultural sector are rice and coffee strong. After Brasil, Vietnam is the second largest coffee exporting country in the world. Also in rice, Vietnam is number two worldwide. The Vietnamese industries produce also food, textiles, shoes, machines, concrete, chemical fertilizers, glass, oil, coal, iron, steel and paper for the domestic market. On the import side are mostly petrol, machines, vehicles and raw materials for the textile- and shoe producing industries. Tourism, particularly by visitors from Asian countries, is very much on the rise since the beginning of the 21st century. Hundreds of thousands of Vietnamese live from the tourist industries. Vietnam’s human rights record remains dire in all areas. The Communist Party maintains a monopoly on political power and allows no challenge to its leadership. Basic rights, including freedom of speech, opinion, press, association, and religion, are restricted. Rights activists and bloggers face harassment, intimidation, physical assault, and imprisonment. Farmers continue to lose land to development projects without adequate compensation, and workers are not allowed to form independent unions. The police use torture and beatings to extract confessions. The criminal justice system lacks independence. State-run drug rehabilitation centers exploit detainees as laborers making goods for local markets and export. Nevertheless, increasing numbers of bloggers and activists have called publicly for democracy and greater freedoms. The age of the bicycle is over in the Southeast Asia of our days. In long decades of the 20th century the roads were crowded with groups of bicycle drivers, with their picturesque rice-straw hats on. In the 21st century the bicycle has been replaced by the motorbike, which is as omnipresent as noisy, dangerous and stinking. Instead of the straw hats one sees now helmets. Masses of cars fill the streets additionally. 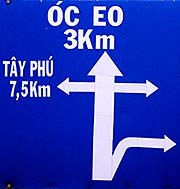 Traffic is now heavy in Vietnam, and increasingly growing. The driving style, however, lacks any qualification. It's totally anomic; nobody cares for rules. Speeding is normal, and who enters a road never checks if there is any traffic. The drivers rely completely on their good luck and that those who could crash into them will care, instead that they do. The horn is used extensively. Trucks and buses, the biggest swines in the stable, are the most brutal. The roads I saw till now aren't the best, and too narrow for the mass traffic. They will certainly be extended by state money, which makes the mess just bigger. However, the countries here in the region have all a desastrous traffic accident rate, and the traffic concept based on individualized, motorized vehicles is the biggest disaster. But motorbikes and cars appeal to the fetish oriented mind with his atavistic status orientation.